View from Willard. 16×20. Plein air watercolor on paper. My plein air painting for Local Color Gallery‘s annual paint out. My first paint out with this gallery was in 2007 or 2008. The paint out attracts a talented group of artists each year. I could not join them during last couple of years. I had a busy Saturday but took the opportunity to do one painting during first half of the saturday. The gallery provides a street map for the paint out area. I drove around and liked couple of views. I picked this one because I liked the view of the city and the backlight. I set up under a tree and painted this in couple of hours while pollen continued to fall on my easel and painting supplies! I framed the finished painting. I had to rush and could not hang out with my fellow artists. 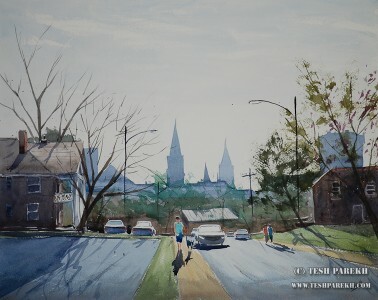 The painting is available and will be on display at the Local Color Gallery.